Your lawn is the first thing your neighbors notice as they drive down the street. It’s the first thing guests notice as they approach your front door. Because of the importance this merits, you want a green, healthy lawn. A lawn that shows that you care about your home. A lawn that’s perfect for the kids to play on. We make sure that you have that lawn. We assess lawn issues, and have the solutions to ensure that your lawn is lush. Your lawn can suffer if you’re overwatering, underwatering, dealing with pests, or if your soil doesn’t have sufficient nutrients to support grass health. If you notice brown splotches throughout your yard, you may be overwatering the grass. Keep an eye out for pooling water, and turn your watering time down if your lawn is squishy underfoot. If you notice dead patches of grass (especially in the sunniest areas of your lawn), you’re not watering enough. Turn the sprinklers on longer and/or more frequently. 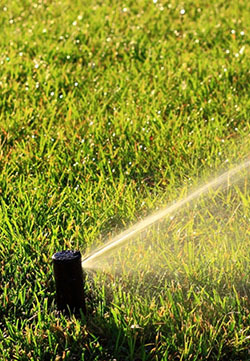 Water your lawn in the early morning, when it’s cool enough that water won’t evaporate right away. If you can’t determine whether your lawn is underwatered or overwatered, give us a call; we can take a look. There are numerous pests that can attack your lawn. From fungus to weeds, and moles to insects, your lawn is under constant assault… OK, it’s not a warzone, but you may have to deal with a few problems from time to time. We can treat your lawn with pesticides, herbicides, and fungicides to ensure that your grass is pristine. If your lawn isn’t green and growing, it’s time to give us a call here at Jeff Fuller Designs. We specialize in all things landscape, and we know who to turn struggling grass into a thriving lawn. Not sure why your grass isn’t green? Don’t sweat it. We can swing by to inspect your grass and identify any problems it may have. Here are some solutions we can employ. 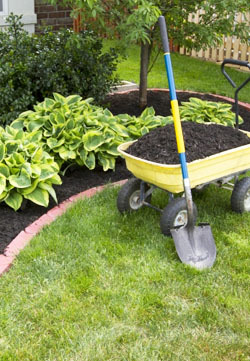 We can apply fertilizer to your lawn to rejuvenate your soil. As grass grows, it depletes the nutrients in the soil near the root of a shaft of grass. Replenish those nutrients with a bit of fertilizer. Again, if you have a pest problem, we have the solution. Have us over to take a look at your lawn, and we can determine the best course of action. We can apply pesticides, herbicides, and fungicides to make sure that your lawn is free from grass predators and pests. Aerating your lawn further ensures that grass roots get the air and nutrients they need to thrive. We recommend aerating your lawn once or twice per year, preferably in the spring and/or fall. Ready to boost your yard health? Get in touch with us today. We provide a litany of lawncare services to turn your lawn into the lushest in the neighborhood. Impress guests and passersby with Jeff Fuller Designs’ lawncare services, and count on us for all of our landscaping services!